Since first stumbling onto an early type of image projector called a magic lantern over 40 years ago, Richard Balzer became instantly obsessed with early optical devices, from camera obscuras and praxinoscopes to anamorphic mirrors and zoetropes. Based in New York, Balzer has collected thousands of obscure and unusual devices such as phenakistoscopes, one of the first tools for achieving live animation. Read more at “Newly Digitized ‘Phenakistoscope’ Animations That Pre-Date GIFs by Over 150 Years“; see more here. As we go ’round and ’round, we might send (differently) animated birthday greetings to John W. “Jack” Ryan; he was born on this date in 1926. A Yale-trained engineer, Ryan left Raytheon (where he worked on the Navy’s Sparrow III and Hawk guided missiles) to join Mattel. He oversaw the conversion of the Mattel-licensed “Bild Lili” doll into Barbie (contributing, among other things, the joints that allowed “her” to bend at the waist and the knee) and created the Hot Wheels line. But he is perhaps best remembered as the inventor of the pull-string, talking voice box that gave Chatty Cathy her voice. 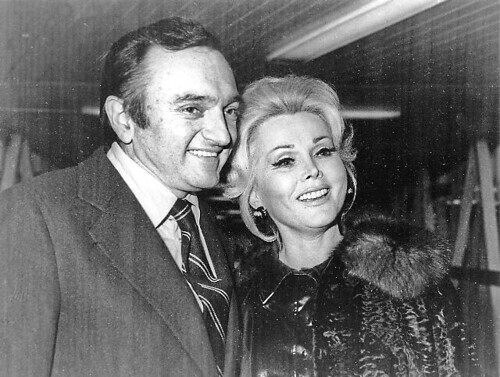 Ryan with his wife, Zsa Zsa Gabor. She was his first only spouse; he, her sixth.